​a group of vets with a special interest in cats? International Cat Care is a charity passionate about improving the care of all cats. They work with veterinary & welfare organisations all over the world, with a panel of feline veterinary medicine experts, with a feline expert behavior team & with a welfare advisory panel. Additionally, individuals with expertise & experience in all areas of veterinary and cat care contribute to the charity ensuring that the level of information provided to all cat owners/carers is second to none, is accurate & up to date. Cats Protection boasts plenty of advice leaflets & FAQs, as well as a glossary. 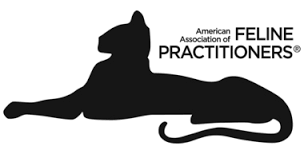 The key to a healthy and happy cat is a well-informed and understanding owner & the American Association of Feline Practitioners (AAFP) have plenty of info to help care for your cat. Anaemia is a feature of many different types of disease processes in cats. Find out more about these causes here. Reducing stress not only improves wellbeing, it can reduce disease risk. Don't think you cat could possibly be anxious? heart disease. It's free and does not involve any stress on your cat's part and can be an extremely valuable tool. whether your "picky eater" or "intermittent vomiter" could actually have an inflamed gastrointestinal tract here.